Professional photographers have been using fill-in flash since Adam was a young lad. It's one of the easiest ways to make your photos better than the point-and-shoot brigade. I've noticed recently that more and more manufacturers of compact cameras are making the default setting flash always on although this is not quite the same as fill-in flash as we will discover, it will produce similar results on a sunny day. The object of the exercise is to reduce the contrast in the scene. One of the main problems in modern photography is that the camera will not record the dynamic range that we can see with our eyes. Our eyes also have a limit to the amount of contrast they can cope with but they are continually adjusting, the iris is constantly widening and narrowing, to compensate for the brightness of the light, so we perceive more detail than we can actually see at a glance. The camera lens also has an iris which can be adjusted of course but, once we press the shutter button, it has to remain at one setting. So what can we do to help reduce the contrast? Use fill-in flash. 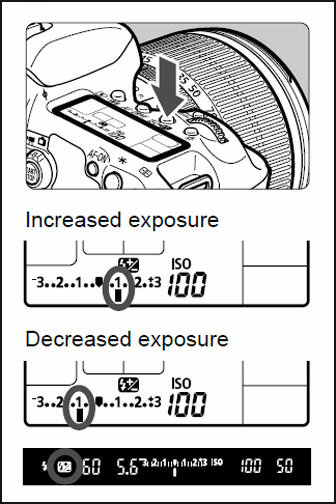 On the left you can see a diagram copied from my camera manual, the Canon EOS 7D, showing the flash compensation scale which appears on top of the camera in the main screen along with info about the shutter speed, aperture, ISO setting etc. Other cameras will have a similar function but you may need to refer to your camera manual to find out where it is and how it works. It is very important to make sure you are looking at the flash compensation adjustment and not the exposure compensation adjustment. The scales can look very similar so look for the little lightning bolt symbol which tells you you are looking at the flash compensation scale. If you adjust the exposure compensation dial, the whole picture will get darker or brighter, which is not what we want at all. In 'normal' use you would set the slider in the middle of the scale so that the flash would deliver the correct amount of light for indoor or night time photography. However, when we use the flash as a fill-in, the intention is not to use it as the main source of light but merely to brighten up the shadow areas. By setting the dial to minus one or even minus two stops we will get a much more natural look to the picture. The exact setting you need for any particular scene is best determined by trial and error although as a rough guide, the sunnier it is the more light you will need to lighten the shadows. So on a sunny day use minus half a stop or one stop (actually the scale on my camera is measured in thirds of a stop, so I would have to choose either 1/3 or 2/3 of a stop not half a stop). On a cloudy day use two or three stops reduction for a more subtle effect. You might, in extreme sunlight, need to use the flash on full power but be careful that you are not creating more shadows with the flashgun. 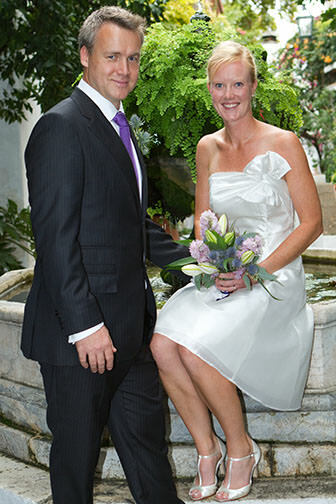 The wedding photo on the left is a classic case of overdoing the fill-in flash. The top half of the picture is OK but there is a shadow cast by their legs onto the stone behind. Turning down the fill-in flash by adjusting the exposure compensation slider would get rid of this. Our aim is to fill in the shadow areas with light from the flashgun so that the overall look is more as we remember the scene. By setting the flash to a lower power, we are not replacing the sun as the main source of light, just lightening up the shadow areas. If we set the flash power too high we will lose the shadows and highlights altogether and the overall effect will be very flat, as it is when we use flash at night when it is the only source of light. 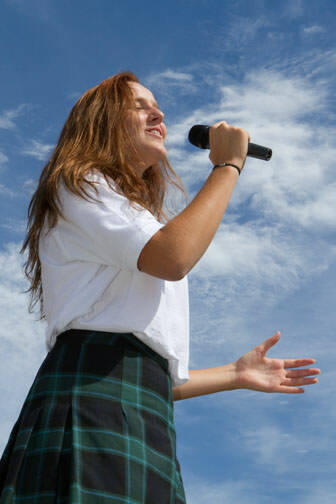 The picture at the top of the page of the girl singing is a good example of using fill-in flash. There are still highlights and shadow areas but there is plenty of detail in both. When is fill-in flash most needed? It is most needed when the sun is very bright. Being a point source of light, the sun is highly directional creating harsh shadows and very high contrast. On a cloudy day the light is far more diffused, coming from all directions at once, so the contrast is much reduced. I would still use fill-in flash when photographing people on a cloudy day but would set the dial at minus two or three stops to make the effect much more subtle. The picture on the left shows a classic example of when we really need to use fill-in flash. 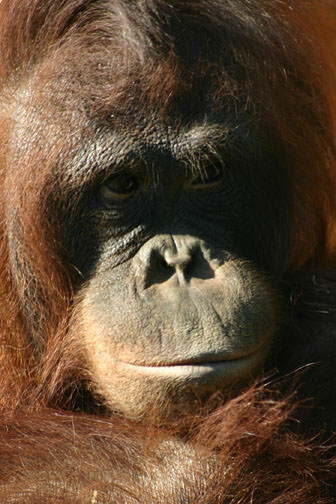 The orangutan's eyes are set deep so they are always in the shade, very rarely does he allow any direct sunlight to fall on his eyes. Unfortunately using flash would most likely startle him and I would have lost his co-operation altogether. Provided that your flashgun is compatible with your camera and works in auto mode then the exposure compensation method will work just as well as it will with the built-in flash on your camera. If you are using a manual flashgun, a studio flash for instance, then you can still use it for fill-in flash but you need to work out the exposures yourself. Or better still, fire off a few shots at different exposure combinations and choose the settings you like best. Using a studio flash outdoors may sound a bit over the top but it is something I have found very useful when photographing large groups in the sunshine, the small flashguns just don't produce enough power to make any difference. So, don't think that those black eye sockets are an unavoidable hazard of photography in the sun, use fill-in flash to put some sparkle back into your subject's eyes.